On one of my recent assignments as a Production Assistant, I bumped into E. Ross on the set for the film, “Da Story B4 Da Glory”. With him being the Production Sound Mixer, he and I had a chance to chop it up and explore each others alternative creative lifestyles. 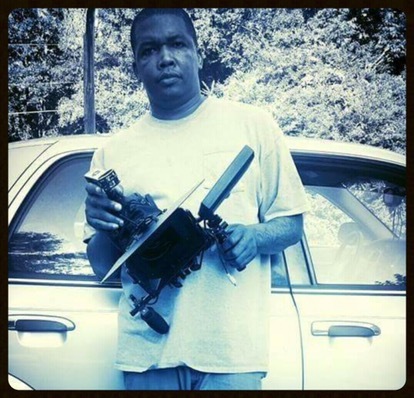 Being apart of the crew is only one element of his formulated equation, E. Ross also runs a small production company based out of Atlanta called E. Ross Films. We produce music videos, documentaries and short films. Throughout the past 10 years I’ve shot over 45 music videos for various Mississippi artist and over 14 street documentary DVD’s called, “Ridin Dirty” and “Sipp Ridin”. The documentaries are geared towards the car fanatics who enjoy nice whips. Between the music videos and the DVD’s I have gotten over 1 million views to date. My latest project is “Whips-of-Atlanta”, which show cases some of the hottest whips in the streets of Atlanta. E. Ross’ goal for “Whips-of-Atlanta” is to become a platform where companies can market and advertise cars and rims on his social media sites. This his way of sharing content and connecting like minded individuals who enjoy nice rides. Follow him on Facebook at Whips-of-Atlanta, on Twitter at @e_ross1969 and view his videos on youtube at E.Ross. Click E. Ross “Whips-of-Atlanta” to view these whips we keep talking about. Previous Previous post: #ViewsFromDaBooth: Emails and Intros.